The Commissioner for Entrance Examinations (CEE), Kerala has invited applications for the Entrance Examination for admission to Post Graduate Degree Courses in Nursing (M.Sc. Nursing) for the academic year 2014 -15 in the Nursing Colleges at Thiruvananthapuram, Kottayam, Thrissur,Alappuzha and Kozhikode and Govt. Seats in Self Financing colleges. A Bachelors Degree in Nursing (Regular course) or Post Basic B.Sc Nursing (Regular Course) after acquiring the General Nursing and Midwifery Course of recognized by a University are eligible to apply. Candidate should have completed one year of experience in any hospital. As the selection is based on the academic qualification and entrance exam, all the students who apply for the post should have to appear for the Entrance Examination to be conducted by the Commissioner for Entrance Examinations (CEE). The entrance test scheduled to be held on 3rd August 2014 (Sunday) will be of 3 hours duration with 200 Multiple Choice Questions. Later, the CEE will publish the rank list of all candidates who appeared in the entrance examination and have furnished the documents. 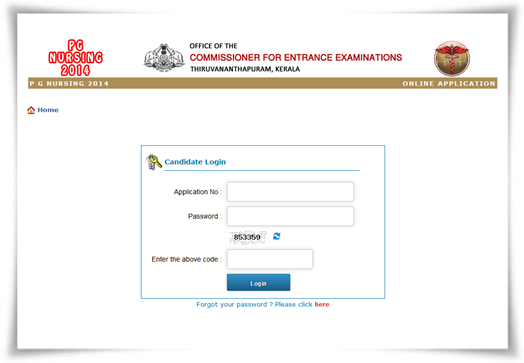 The prospectus and online application form will be available from 2nd July to 14th July 2014 in the website www.cee.kerala.gov.in. Candidates who are seeking admission to this course can apply in the online application form provided in the website of the Commissioner for Entrance Examinations. Students should remit the required fees at any State Bank of Travancore Branch using the Bank Chalan available with the print out. As the application form and prospectus will not be available from the Nursing Colleges or from the office of Director of Medical Education or from the office of the Commissioner for Entrance Examination, students should have to rely on the online facility. All Candidates seeking admission to the M.Sc Nursing Courses must take the printout of the online application, affix their passport size photograph in the space provided in it and get it attested by a Government Gazetted Officer. The completed application printout should be forwarded with all the required documents along with the original chalan/DD to the Commissioner for Entrance Examinations, Thiruvananthapuram through Registered post/Speed post or hand delivery on or before 5 pm on 14th (Monday) July 2014. Late, defective and incomplete applications will be rejected. The admit cards of the candidates whose applications have been accepted will be available from the official website of the CEE from 25th July 2014. It is very important to note that, candidates who are appearing for the exam should go through the Prospectus before available in the website before submitting their applications.